Alcorn, ASU, and Alabama A&M represented. 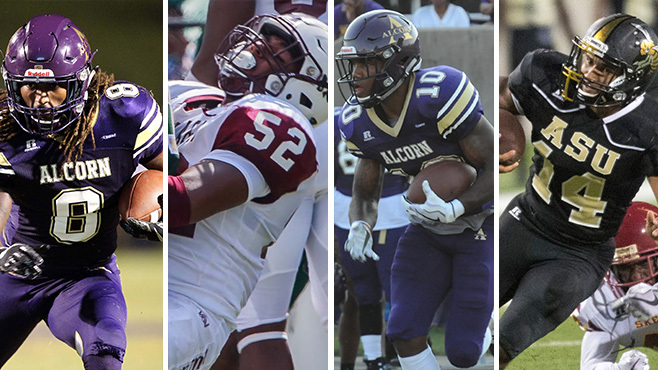 BIRMINGHAM, Ala. – Alcorn State senior running back De’Lance Turner, Alabama A&M senior linebacker Kenneth Davis, Alcorn State junior wide receiver/return specialist Marquis Warford and Alabama State sophomore quarterback Kobie Jones were all named the Southwestern Athletic Conference Football Players of the Week in week one of the season for their outstanding play. Turner registered a pair of touchdowns (one receiving, one rushing) for the Braves in the 50-21 season opening win over Miles College. He finished with 128 rushing yards and 38 receiving yards. Turner was one rushing yard shy of his career-high 129 set at Jackson State last season. His 88-yard run in the third quarter marked a career long. Turner tallied 166 all-purpose yards, averaging 16.0 yards per carry. Davis was strong in defeat as the linebacker made eight solo tackles with two assisted tackles to go along with several impact plays including two sacks for minus-8 yards and another three tackles for loss for minus-9 yards as the Bulldogs dropped a 38-7 decision to UAB. Warford made the special teams play of the night with a 72-yard punt return for a touchdown. He shook a couple defenders and sped past the coverage for the score. Warford ended the night with a career-high 190 all-purpose yards. In addition to his punt return, he hauled in 69 receiving yards on seven catches and racked up 63 kick return yards to help lead the Braves to a 50-21 win over Miles College on opening night. Jones made his first career start at quarterback for the Hornets on Saturday night. He completed 20-of-38 passing for 173 yards and a touchdown. Jones hit a long pass of 20 yards on the night, and was sacked just one time. He also rushed for 46 yards on 11 carries for Alabama State in their 14-6 loss to Tuskegee.